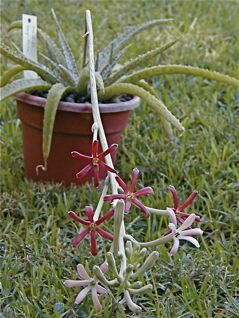 Manfreda Salisbury is a genus of robust herbaceous plants with rosettes of plain green or mottled, often thick, succulent leaves. 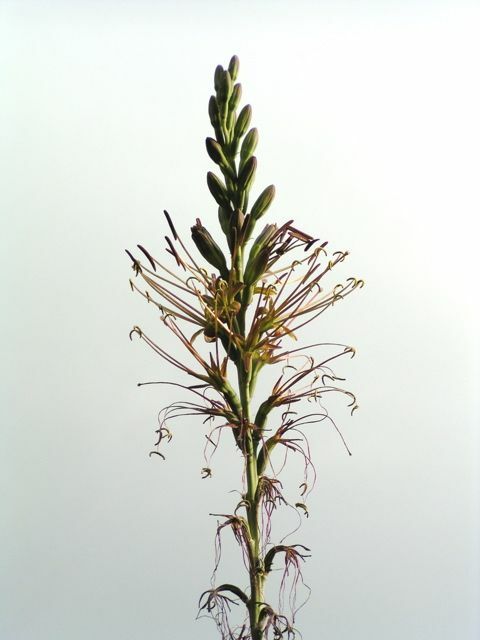 This genus is in the Agavoideae subfamily of the Asparagaceae family. 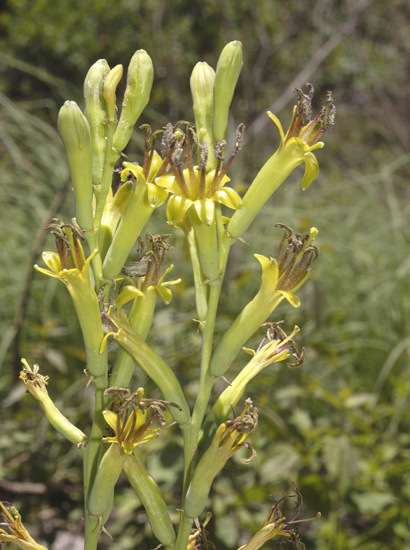 The flowers are generally tubular, dull white, yellow, green, or brownish, solitary at the nodes, on a tall raceme or spike, and generally have some kind of scent. 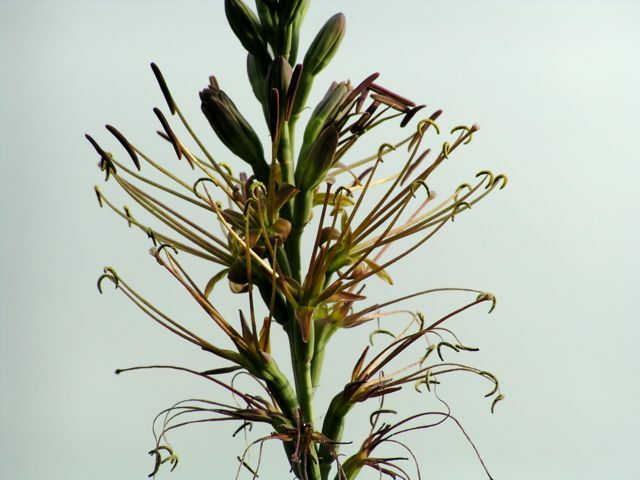 The stamens are exerted and brownish, greenish, yellowish, or whitish in color. 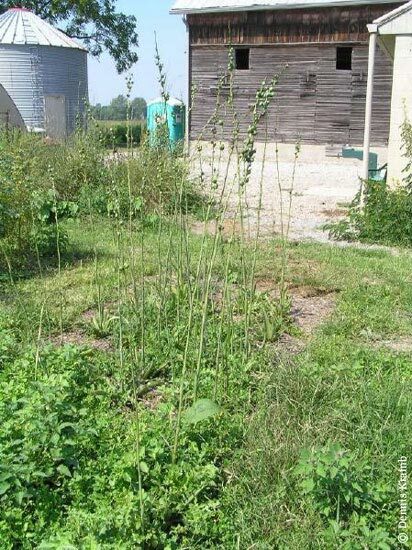 The underground structures are cormous or rhizomatous. Approx. 28 species are native to the southeastern United States, Mexico, and Central America. They do best in full sun in a dry part of the garden. Night-flying hawk moths are frequent visitors to these summer or autumn blooms. Hummingbirds seem to love them also, often perching on the stalks in early morning. 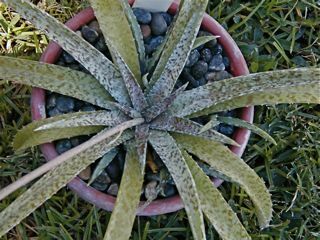 The genera Manfreda, Polianthes, and Prochnyanthes, differ from Agave in being herbaceous and bulbous. Some authors combine Manfreda and Polianthes, but they are distinct. The weirdly beautiful manfredas confirm their relation to Polianthes by hybridizing if offered the opportunity. 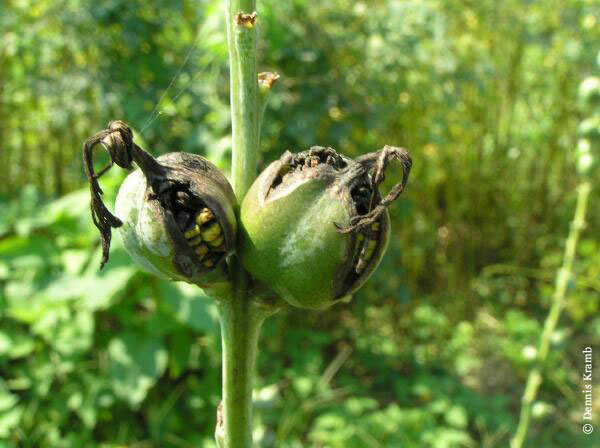 The black, flattened seeds grow easily and flower in their second or third year, so this is a good project for the home gardener. Hybrids include: Manfreda virginica × Polianthes tuberosa 'Mexican Single', produced a few years ago by Susan Verhoek-Williams who obtained a 6 foot tall hybrid with large greenish-white flowers and thin, spotted leaves; and Manfreda maculosa × Polianthes tuberosa, resulting in very good waxy white-flowered hybrids which turn reddish with age. 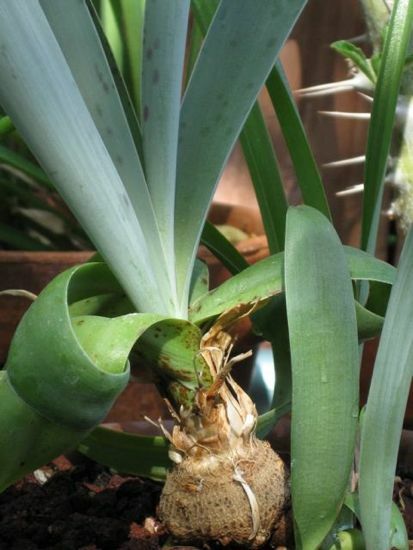 (Information from Thad Howard's Bulbs for Warm Climates and Scott Ogden's Garden Bulbs for the South.) See References. 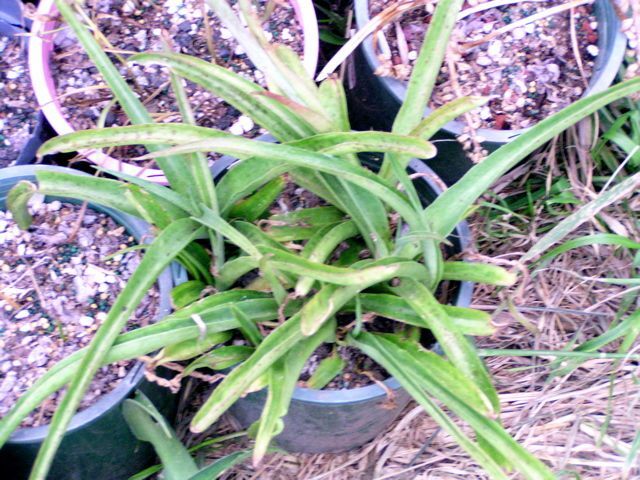 Recently, a number of other Manfreda × Polianthes hybrids of various kinds have been produced at the University of Arkansas. 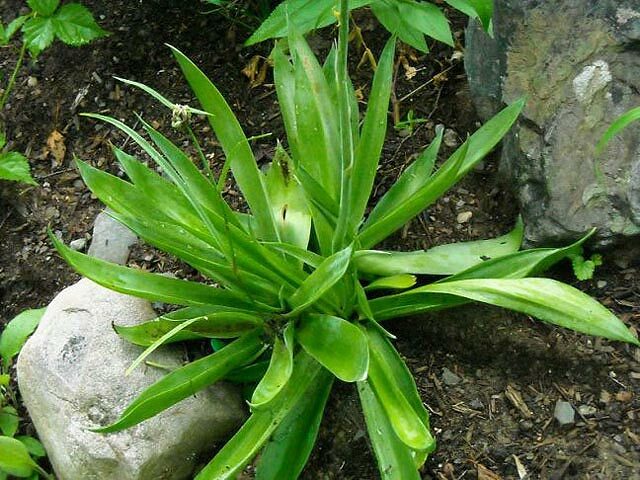 There have also been hybrids of Manfreda with Agave referred to as ×Mangave. 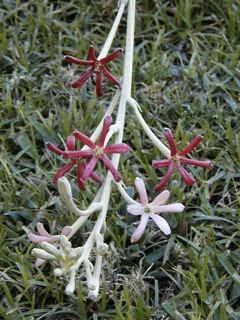 Manfreda longiflora , syn. 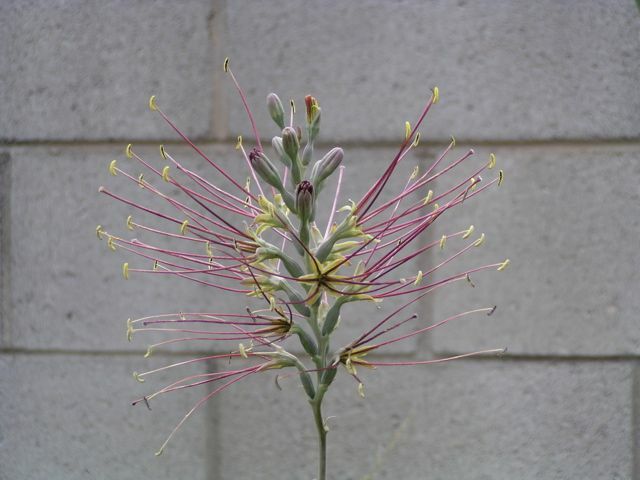 Polianthes runyonii is a rhizomatous species native from Texas to Mexico. 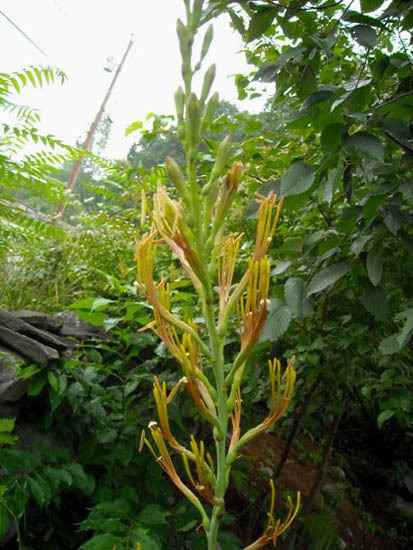 It tolerates summer heat, is evergreen and blooms in the fall. The flowers first open pure white in the evening and then are pinkish by the next morning. By the next day, they have turned red. 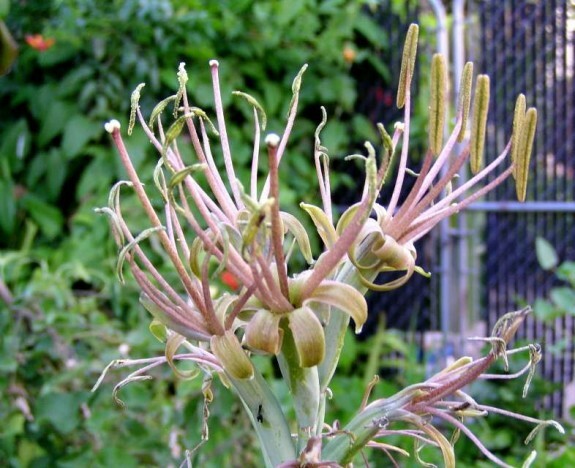 They are strongly scented at night, sort of a spicy tuberose. The species is now absurdly rare in the wild. Photos by Monica Swartz. 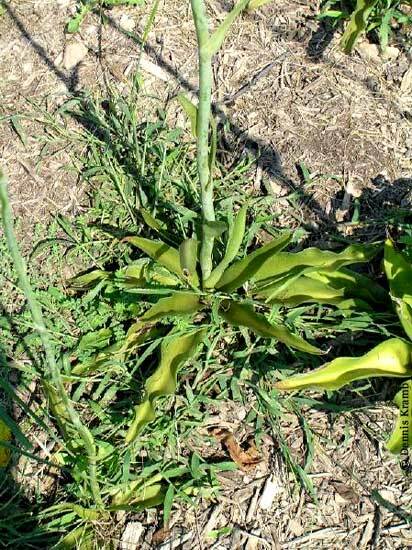 One photo shows the denticulate leaf edges that are diagnostic for this species. 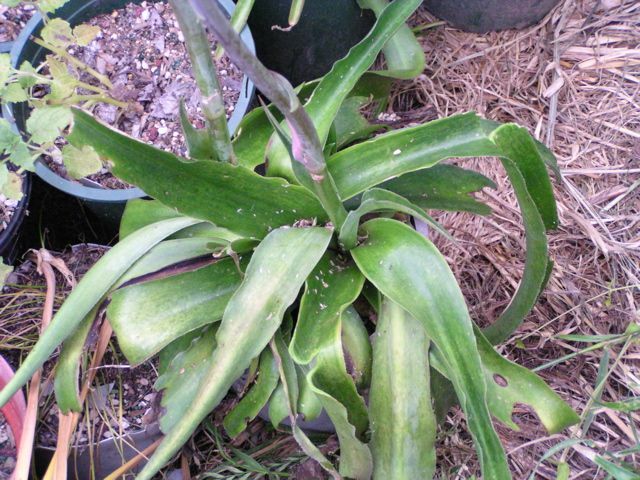 Manfreda maculata is native to Mexico, Guerrero, and Oaxaca States. 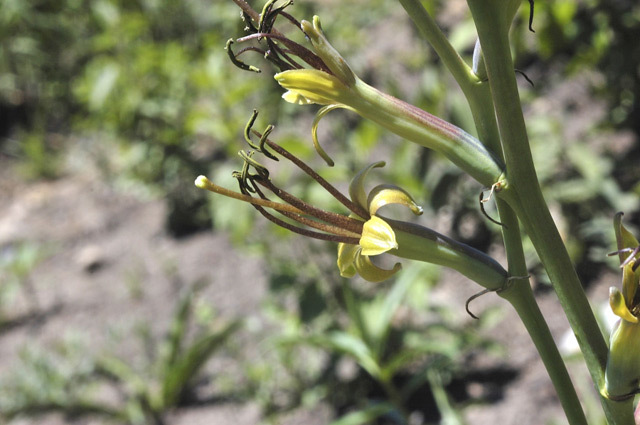 The photos below were taken in habitat near Ixtapan de la Sal by Dale Denham-Logsdon. Manfreda singuliflora identified by Susan Verhoek on the basis of the photo below. 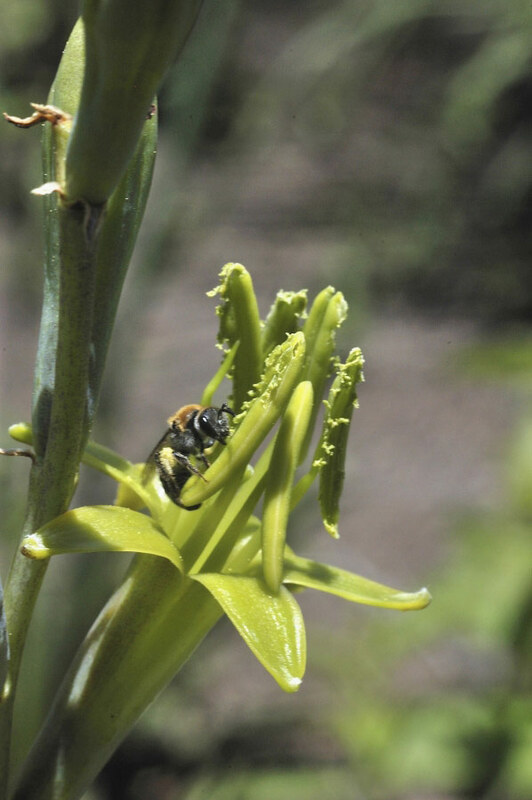 She gives the range of this species as the Sierra Madre Occidental in Durango, Chihuahua and Zacatecas, growing in oak forests. The plant was purchased as Manfreda virginica at a plant sale in the Washington, D.C. area and has survived two winters outside in a leaky cold frame in the USDA zone 7 garden of Jim McKenney who took this photo. Manfreda sp. 'Helen Wynans' This one is like a manfreda on steroids. The leaves are larger. 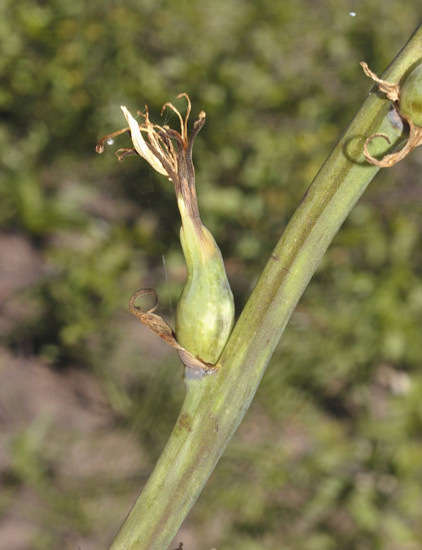 The flower stalk is much taller. 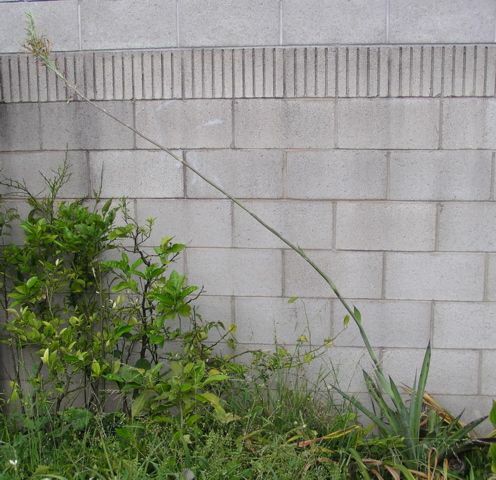 (The fence behind it is 6 feet tall and when the flower stalk stands completely straight up, the flowers are higher than the fence.) The first photo shows the entire flower part of the scape. 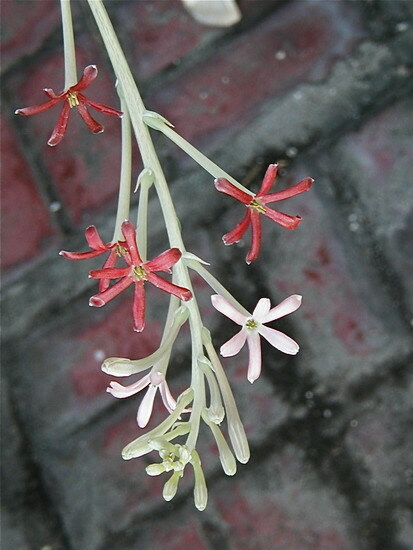 The second one is a close-up of the flowers themselves. 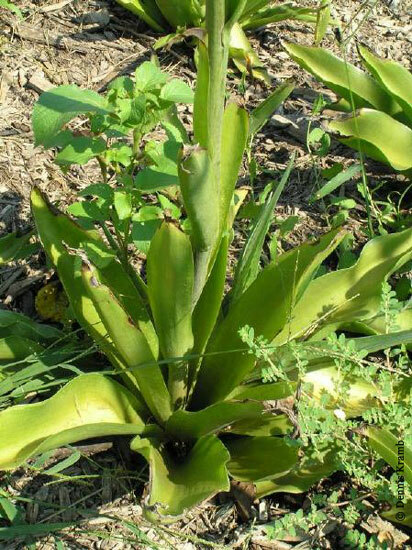 The third photo shows the rosette of leaves at the base of the scape. 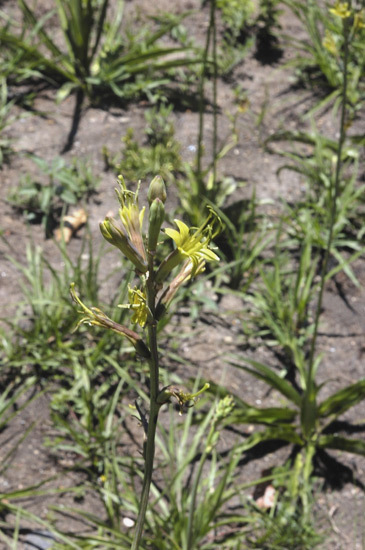 The fourth is an attempt to show the entire plant in bloom. Photos taken May 2005 by Lee Poulsen. Manfreda sp. (ex Yucca Do). One of a number of manfredas offered by Yucca Do. 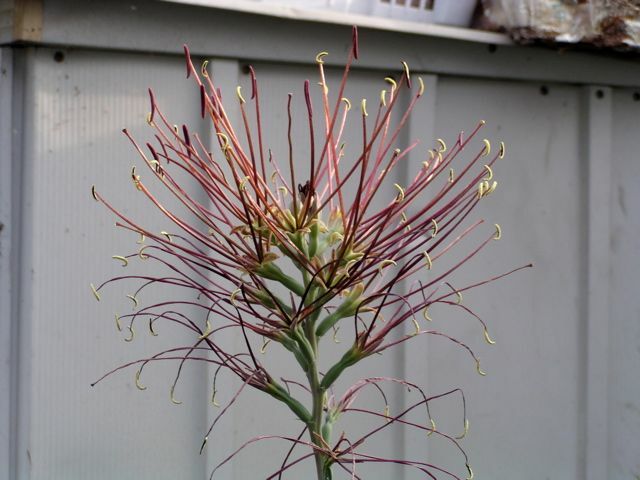 The flowers are at the top of a long, 4-foot, scape and have very long stamens. The label on this one has gotten lost, so I don't know which species it is. 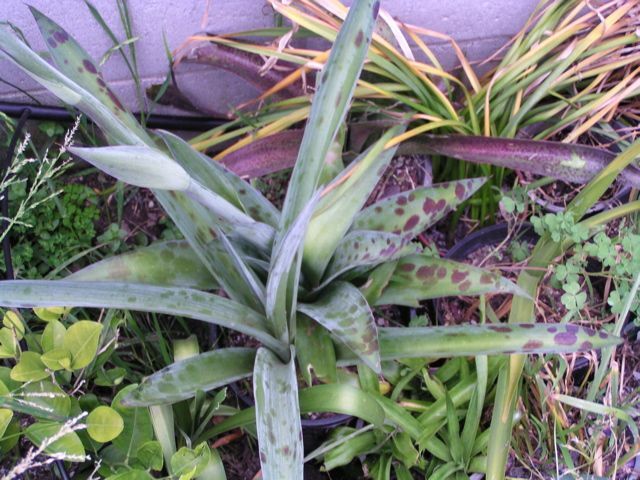 The leaves are mottled as many in this genus are. Photo taken Sept. 2003 by Lee Poulsen. Manfreda sp. 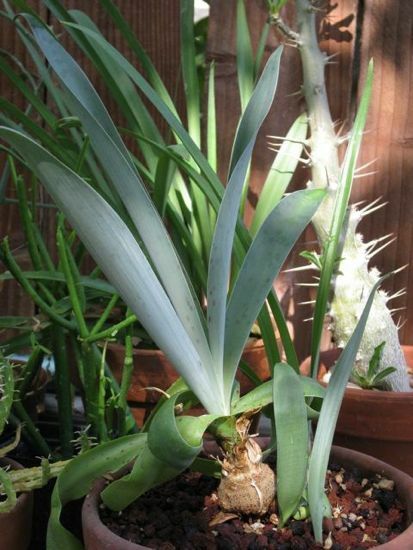 (ex Huntington BG, ex Yucca Do). This plant came from the Huntington Botanical Gardens some years ago. It was labeled: "Manfreda sp. 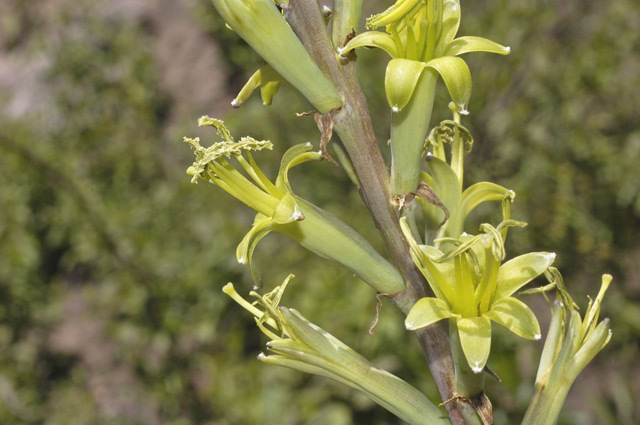 HBG 82906 Yucca Do T74-12 Sd. coll. 12/97 Mexico: Jalisco. Very dry rocky slopes". 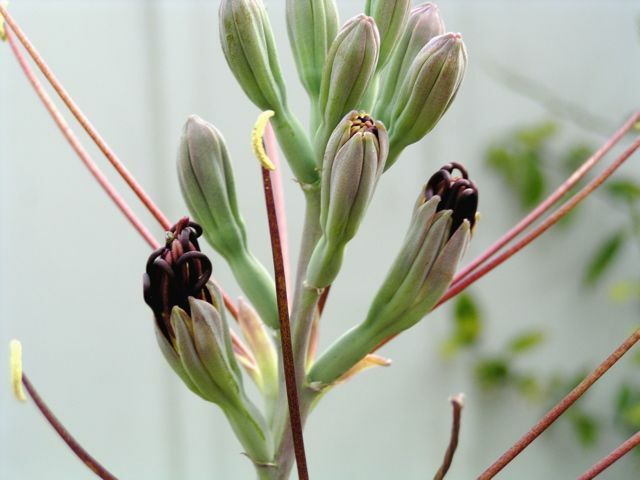 It flowered for Monica Swartz this year for the first time and its green flowers were unscented. 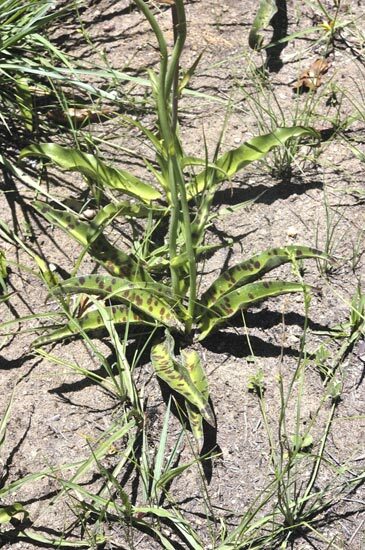 The leaves are spotted when they first emerge (it loses its leaves in winter) and then the spots fade through the summer. It offsets vigorously. Photos by Monica Swartz. Manfreda undulata The flower stalk on this one is about 4 feet tall. The first photo shows the flower part of the scape. 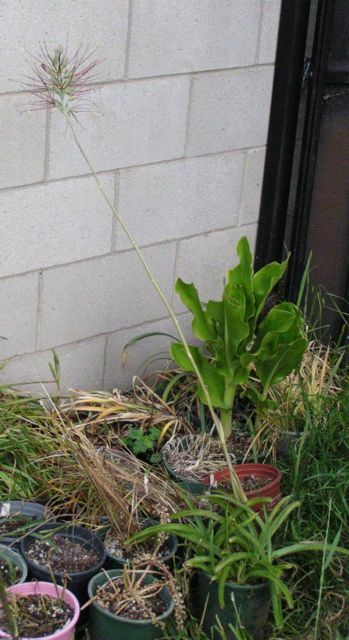 The second photo shows the rosette of leaves at the base of the scape. 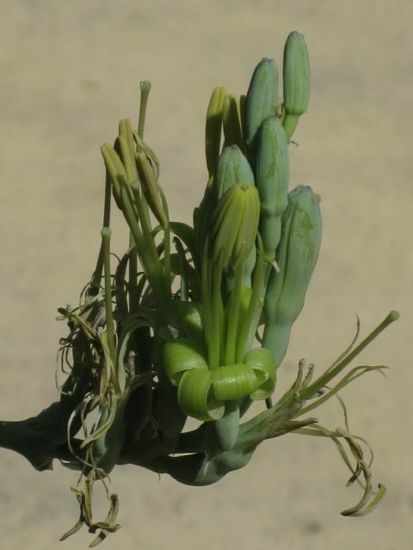 The third is meant to show the entire plant in bloom. 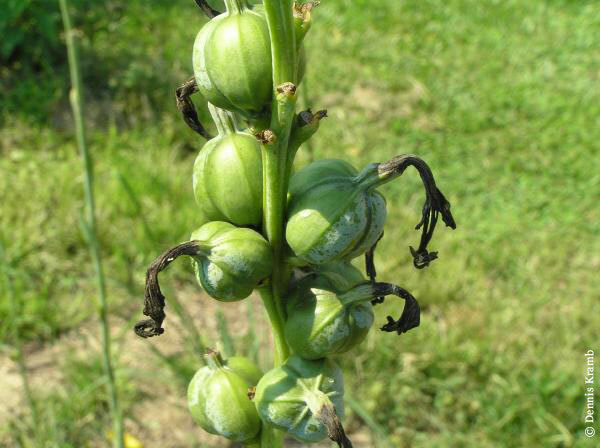 (There are two scapes on this plant.) 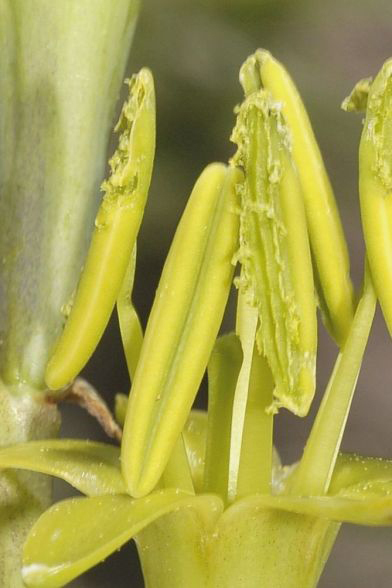 The fourth is a close-up of the flower, which is mostly stamens, starting to unfold and you can see all the long stamens bundled up inside the bud. Photos taken May 2005 by Lee Poulsen. Manfreda variegata 'El Naranjo form' The flower stalk on this one is relatively short; only about 3 feet tall. The first photo shows the flower part of the scape. 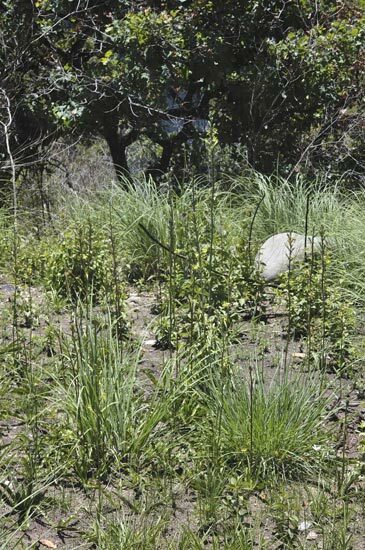 The second photo shows the rosette of leaves at the base of the scape. 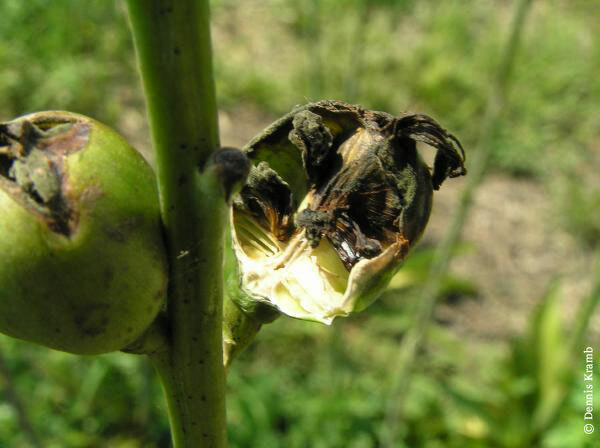 The third is meant to show the entire plant in bloom. Photos taken May 2005 by Lee Poulsen. 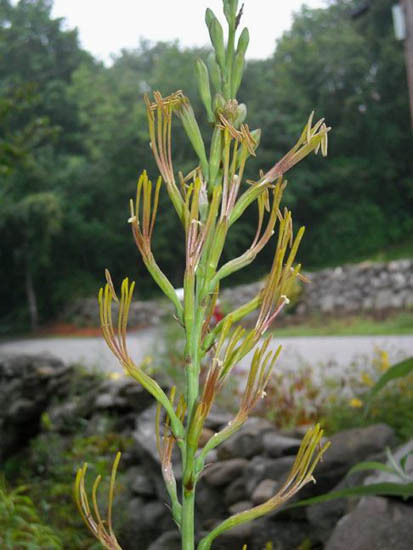 Manfreda virginica is native to the eastern United States. Photos 1-6 (row 1) are from August 2005 by Dennis Kramb and show various aspects of the seed pods and bloom stalks which can reach up to 7 feet, though most are around 4 to 5 feet. 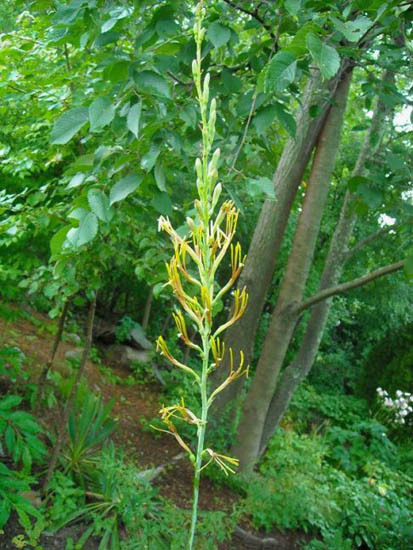 Images 7-9 (row 2) show the plant in bloom in Mark McDonough's garden in Massachusetts in July and early August 2008, producing a 6 foot tall stalk. 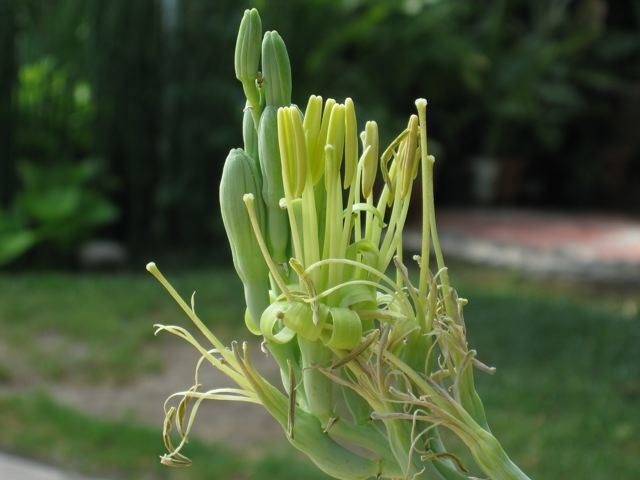 The inflorescence is mostly composed of over-sized stamens and anthers, yet at the center of each flower is a tiny three-lobed whitish tube that offers surprising fragrance for something so insignificant in size. Image 10 is another view of the foliage.